Today’s episode of Cross Link Radio is about Shirley’s Nutrition Continuum. While the battle cry Just Eat Real Food is spot on, that’s not often realistic for people. Shirley has created a way to monitor the way a person eats and makes distinctions between food and something to eat in a short little infographic that can help people decide if they’re on any track at all. The patient consulting that Shirley does is also featured in this episode. Patients need help! They are duped to believe that dental decay is their own fault, that they don’t cut enough sugar or use enough fluoride, or floss enough. There’s more to dental diseases than that. Brush, floss, fluoride as gotten us as far as we can go. Our diets contribute massively to diseases of the teeth, but not only topically. 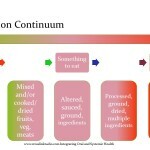 the continuum she developed is not only for systemic health it’s for dental health as well. Then there’s the Blab.im discussion Shirley had with Lory Laughter, RDH, MS of Dental Hygienists Alliance. October was Dental Hygienists Month. Neither Shirley and Lory talk about the American Dental Hygienists’ Association, and the missed opportunities. They voice their opinions on what they see as sensible changes that can benefit patients and the profession. The hour long Blab is the first for Shirley and for Lory. Let us know if you liked it and whether or not you’d like more. Don’t forget to subscribe to the CrossLinkRadio.com website. Also don’t forget that Shirley has written a series of books that may benefit you or your dental hygienist. Take a look at www.rdhpurpleguide.com. Stay tuned for continuing education opportunities through the Cross Link Radio episodes.